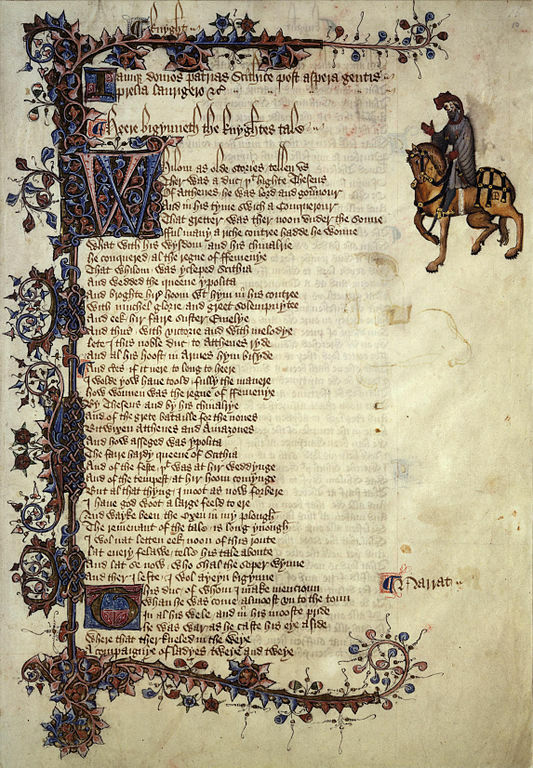 Introduction: The Knight in Geoffrey Chaucer’s The Canterbury Tales has always attracted a great deal of critical attention. Throughout the twentieth century in particular, views on this “worthy” knight have varied greatly. For the greater part of the century, critics such as Myrtle Bowden and J.M. Manly have regarded him as a representation of idealized knighthood, a force of unquestioned good in a world gone topsy-turvy, hearkening back to the heroes of chivalric romances. However, by the 1980s, a reactionary critical viewpoint had developed. By the time Chaucer wrote the Tales, the age chivalry, of loyalty and service based largely on feudal ties, was over, replaced by a system in which warriors fought not because of fealty, but for pay. Seen against this framework, some critics have viewed the Knight as a cruel mercenary, a scathing satire of this ignoble state of chivalry. This viewpoint was best exemplified in Terry Jones’s 1980 book Chaucer’s Knight: The Portrait of a Medieval Mercenary, in which Jones attempts to refute virtually all Chaucerian critical tradition and turn the portrait of the Knight entirely on its head, leaving us with not a paragon of virtue, but the very scum of the earth, a man who preys mercilessly on his fellow Christians and will stop at nothing to gain profit. Neither of these traditions is, however, in the last analysis satisfying. Rather, a third way is possible. The Knight in The Canterbury Tales is best viewed as neither a wholeheartedly approving embodiment of the values presented in the courtly literature and chivalric romances of the twelfth and thirteenth centuries nor a vicious marauder preying on innocent Christians, but rather as a relatively realistic, albeit somewhat idealized reflection of a living, breathing knight at the close of the fourteenth century. In the General Prologue, the Knight receives only 35 lines of description. However, these mere thirty-five lines tell us a great deal about him as both a man and a knight. The description begins with a summation of his various virtues. He is described as “a worthy man…he loved chivalrie/Trouthe and honour, fredom and curteisie” (43-6). The first difficulty comes with the word “worthy.” Throughout his description, the Knight is deemed “worthy” no less than five times, a remarkably high number of instances for such a short selection of poetry. Different scholars interpret this word in varying ways. Terry Jones claims that “A ‘worthy man’ for example, did not primarily mean a man ‘deserving honour’ or ‘of great merit’ as it does now… [Chaucer] almost invariably used it to mean ‘well-to-do’ or ‘of high social standing’”. Other critics engage directly with Jones, flatly refuting his claim and saying that worthiness betokens being “distinguished by good qualities; entitled to honour or respect on this account; estimable”. Additionally, the word has possessed this meaning since the beginning of the fourteenth century, making it entirely plausible as a descriptor for the Knight.